Block the Boat – Autonomous Action. @ Berth 57, Port of Oakland. Possible rides from West Oakland Bart. Shuttles are up amd running as is BART! Come on in!! #BlockTheBoat! Autonomous Action: Block The Boat! @ Berth 22, Port of Oakland. Possible rides from West Oakland Bart. and is now heading back into San Francisco Bay, probably to Berth 22 (map below), which people reported Zim had reserved for this evening. Ceast and Desist: It Ends Today! @ See text. And of course, there have been thousands and thousands more murdered Black, Brown & poor people throughout the years. PLEASE choose a different location for you and your comrades to begin the action! It is important that we show the power of the people to a larger share of our city than just OG plaza. Ferguson Solidarity March Brings Out 200 OPD, Helicopters. Hundreds flooding back into OGP. "Hey hey ho ho, killer cops have got to go"
Maybe 25 people at the plaza & 50 OPD. Man yells at them: "there are like 3 motherfuckers here, what are you doing?" 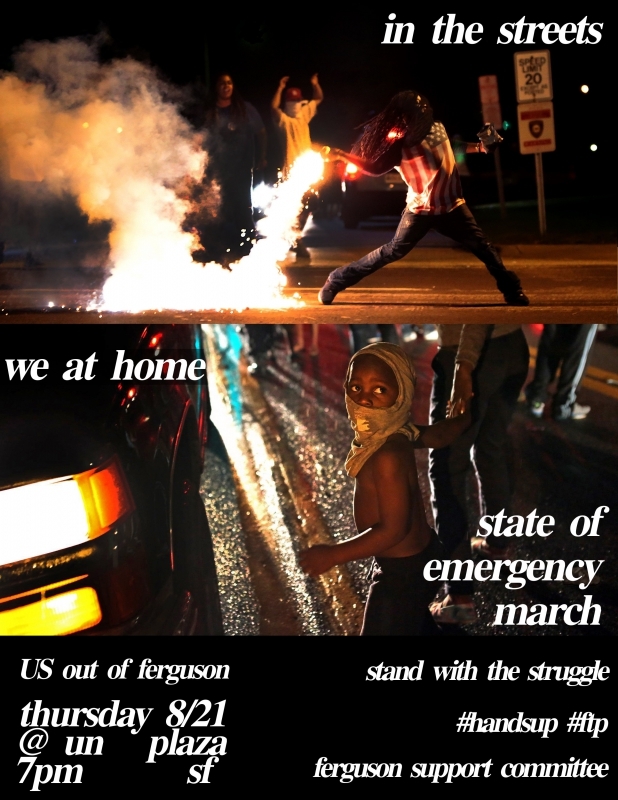 Stand in solidarity with the people of ferguson. March starts at un plaza. The folks who serve you your hot dogs and nachos at the Oakland Coliseum deserve respect! Many of them are longtime Oakland residents who’ve worked at the ballpark for 10, 20 or 30 years and count on their jobs for a stable income and health care. But this year, a new company, Ovations, took over the food service operation. Instead of sitting down to negotiate a fair contract, Ovations is stalling, asking for take-aways, and offering unfair proposals. *Seven months into bargaining, Ovations hasn’t even given us a proposal on health care. *Ovations’ proposal on wages is a 25-cent raise over 3 years. That’s 8.3 cents a year. *Ovations is also proposing to subcontract as many stands as they want, let managers do union workers’ jobs, and institute drug testing. JOIN COLISEUM WORKERS for a march across the Coliseum parking lot to reach out to fans as they tailgate before a big game! Let Ovations know that they can’t come in from out of town and disrespect Oakland workers who’ve been on the job for years! For questions or rides, contact Jessica Medina (jmedina@unitehere.org, 510-219-6358). 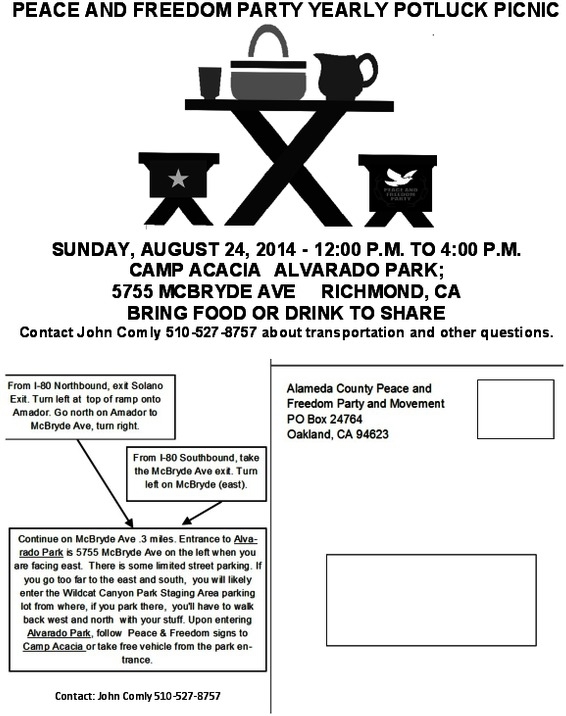 PEACE AND FREEDOM PARTY YEARLY POTLUCK PICNIC . Last week’s event was a big success, so we’re doing it again. Come hang out with the people Occupying outside of Staples, advocating the Staples boycott. Expect great music and great conversation, and postcards to US mail to Staples telling them why you are boycotting. Maybe food too! The US Postal Service has contracted out Post Offices to Staples stores, replacing living wage Postal Union jobs with min wage non-union Staples employees. Let’s keep the pressure on and make sure students back at UC Berkeley and buying supplies know why they shouldn’t be purchasing stuff at Staples. before, during and after Death Row. who has devoted his life both inside and outside prison to resistance media. He is the author of eight books and hundreds of columns, articles, and radio broadcasts; an organizer and inspiration for the prison lawyers movement where prisoners dedicate time to helping fellow prisoners; former member of the Black Panther Party, and supporter of Philadelphia’s MOVE organization of the 1970s which advocated green politics, expressed its opposition to technology and zoos, and supported animal rights. Mumia was framed for the death in 1981 of Philadelphia policeman, Daniel Faulkner, and has spent more than 30 years in prison, almost all of it in solitary confinement on Pennsylvania’s Death Row. Mumia Long Distance Revolutionary is a powerful documentary that includes the story of the Philadelphia police crackdown of the MOVE organization in the late 70s. 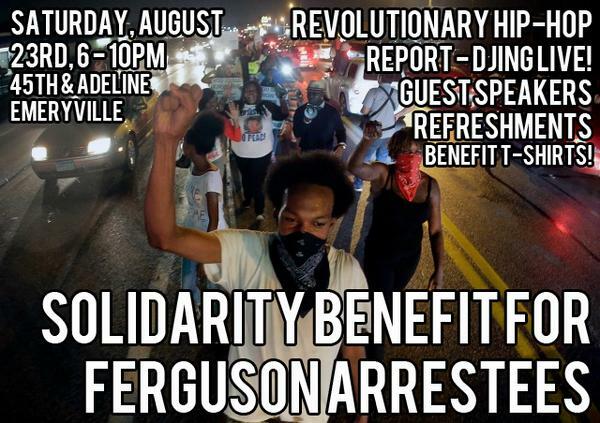 You can make your own connections between that event and more recent events in Ferguson, MO and elsewhere. 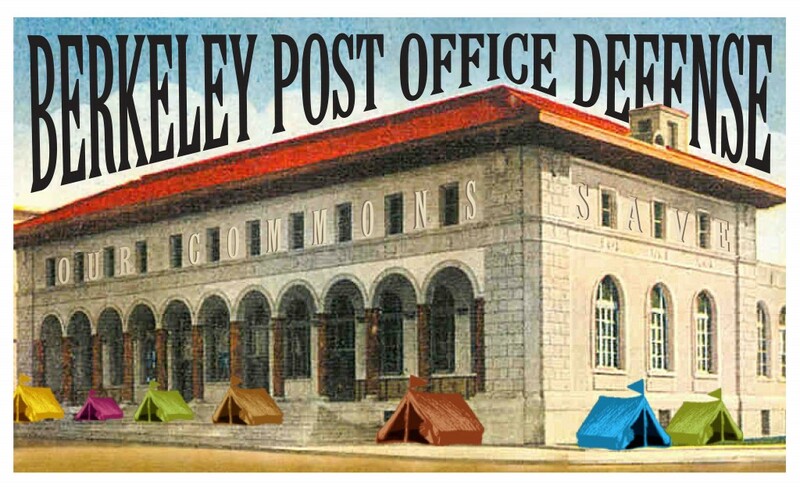 We have joined with other activists in Berkeley to put a ballot initiative on the ballot to rezone the Berkeley Post Office and other areas in the Historic District to prevent privatization, and also to insure a better Downtown Berkeley. We succeeded in getting the necessary signatures; it will be voted on in November, but Tom Bates and the City Council have nefarious plans to undermine our coalition. Bring a Friend. Let’s Fill the Room! Planning Commission agenda for the 8/27 meeting. 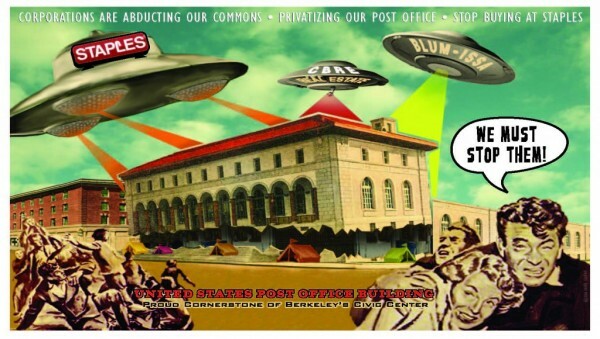 Measure R on the November ballot will guarantee that our historic Civic Center – including the Main Post Office and Old City Hall – are reserved for public-serving uses, and that our Downtown is developed in concert with Berkeley’s values of equity, access and support for the environment. guarantee jobs for Berkeley residents and fair wages for construction, maintenance, security and hotel workers. Measure R protects Our Civic Center as a public commons � in perpeetuity � preserving traditional uses that serve the common good succh as museums, libraries, government, non-profits, arts, live performance venues and farmer’s markets. No future Council can vote to allow exclusively private uses – ever. In November vote “YES” on R for a Green, Equitable and Civic Downtown. Don’t Buy School Supplies at Staples! Come and bring friends and family to enjoy a day at the park full of music, art, and community hosted by the youth of Xicana Moratorium Coaliton – CoatlNecalli. Dance and enjoy the beauty of Oakland while also finding out what is going on in our streets and how you could get involved in all the amazing movement work that is happening in our city. Ohlone Prayer, All Nation Drummers, Rey Lara, Ron San Miguel, Poor Magazine, Almas Fronterizas, 67 Suenos, Quebradita by Kreadores, Balet folklorico costa de Oro, La Ceiba Cumbia Band, Esai, Beats and Flows, Son Jarocho band – Tarimba, DJ Aztlan, and much more! Kids Activities, Vendors, Free Food. 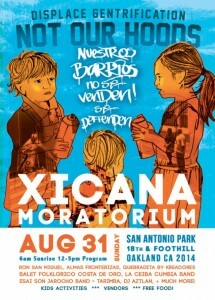 Why we continue holding Xicana Moratorium Day? In 1970, over twenty-thousand Raza people filled the streets of LA to call for an end the War crimes in Vietnam that not only took a toll on Vietnamese lives, but also took the lives of Raza and other folks of color being disproportionately put on the front lines to die for this capitalist for profit country.� Chicana Moratorium Day called an end to the violence and crimes the U.S. government was committing abroad, but also called for an end to the violence, crime, and inhumane conditions that Raza and other communities of color were experiencing in barrios and ghettos all over the U.S. at the hands of police, the education system, the prison system and other arms of this capitalist system.� More than forty years later we gather to continue calling an end to the terrorist criminal acts of the U.S. Government over sees and here on our streets. When we move further west, we can see Palestine as another perfect example of displacement at the hands of this Government.� Mainstream media constantly justifies the ongoing genocide of Palestinian people at the hands of U.S. trained and funded Israeli military, but how could you justify 80% of the casualties at the hands of Israel being civilians, most of which are children and elders?� Let’s not forget the backyard of the U.S., Central America, where the U.S. has funded, trained and controlled both puppet governments and its military at many different junctures throughout the history of the United States.� The U.S. has caused so much instability and violence that today the violence in Honduras is comparable to the violence in Iraq during the peak time of the War.� This violence has caused thousands of children to flee their home countries and brave the dangerous trek up north just to have a chance at survival. When you visit the San Francisco Mission today � one of San Francisco’s most highly gentrified neighborhoods � its as iif there was no semblance of a once predominantly Raza neighborhood with a rich culture.� The Mission today attempts to continue profiting off of the beautiful Raza culture, but the city has brought in gang injunctions that criminalize brown youth that once lived there, no loitering laws that specifically target homeless people, and condos that have made rents skyrocket and make housing no longer affordable for working class families.� Now white young professionals can enjoy the culture of the Mission, eat at fancy new restaurants, enjoy the fancy new clubs, and park their beamers at $5 an hour meters without having to fear that the people who once lived there will be roaming the streets.� � When you cross the bridge to Oakland, a very similar dynamic is taking place.� We have seen gang injunctions, no loitering laws, proposed youth curfews, proposed stop and frisk laws and increased budgets for the police department who we know are intended to push out people of color from the streets and neighborhoods of Oakland.� We have seen the condos and are seeing area specific plans like the West Oakland Specific Plan and the East Oakland Specific plan that attempt to “revitalize” and further develop areas to attract new residents that will bring with them more money and will attempt to displace working class communities of color from communities we have been long rooted in. This long and ongoing history of displacement can cause anger and resistance towards this government, and for that reason, the U.S. has heavily funded their population control plan which takes the shape of prisons, detention centers, deportations, the heavy militarization of our streets, counter insurgency strategies here at home, and the heavy surveillance of its population.� In September, Oakland plans to host and support the funding of the 9th Annual Urban Shield conference, a training for SWAT and Police agencies that brings together local, national and global law enforcement agencies with defense industry contractors to provide training and introduce new weapons and suppression tactics to these agencies that will later be used to further militarize our streets.� Today prisons and detention centers have become for profit cages that force men, women and children to live in conditions that are so inhumane, that last year, 30,000 California prisoners engaged in sixty day hunger strike to demand basic human rights within these cages.� Today the U.S. Senate mocks the humanity of our people by supporting new legislation that would reverse federal law that protects Central American children from deportation if they face the threat of violence in their home country, and calling that bill the “HUMANE Act.”� This so called HUMANE Act would lead to the deportation of thousands of Central American children. On the 35th annual Bay Area commemoration of the 1970 Chicano Moratorium Day we want to call attention to the displacement and gentrification we see in working class communities through out the country, but we also want to draw the connection of the different forms of displacement and terror that this country is causing through out the world.� We still call for a Moratorium on the war against indigenous people, third world people, against our land and against what every community should hold as their treasure � the Chhildren!� We ask that you all join us this year as we celebrate La Resistencia and we stand collectively to honor the struggle that we must continue upholding now more than ever! Shut Down the Freeways for Mike Brown. @ Across the United States. FERGUSON, Mo. — Activists on Saturday called for mass civil disobedience on the highways in and around this St. Louis suburb to protest the killing of an unarmed black teenager by a white police officer, with the leaders of one coalition encouraging supporters to stop their cars to tie up traffic on Labor Day.